Can my minor children get passports without their fathers consent? Question: I have sole custody of my 2 children ages 13 & 10. Their father has made no effort to see them in over 6 years. Can they still get their passports without him being present or without his consent? I have a permanent restraining order against him, but there are no restrictions to seeing his children. He has just chosen not to. Last we knew he lived in Hackensack, New Jersey--10 minutes from the kids and me. My 13-year-old daughter has expressed to me that she would like to take a cruise from my brother's in Florida to the Bahamas. But a passport is needed to do so. Answer: If you have sole legal custody of your children and have the document to prove it, then your children do not need the consent of their father in order to obtain their passports. For a list of application requirements and a list of documents you can submit to prove sole custody, click the link below. 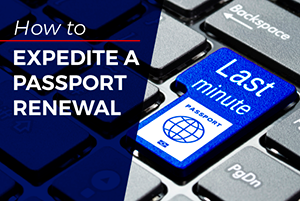 Be aware, it takes 4-6 weeks to process passport applications. Requests for expedited services are done in 2-3 weeks. If your daughter needs the passport sooner, you must apply at a regional agency that serves New Jersey or through a professional expediter. For more information click the link below. Comments for Can my minor children get passports without their fathers consent? Question: I want to renew my daughter's passport but i don't know where to find her dad. We've been separated for 5 years. Do i still needs his consent to renew her passport? Answer: Passports issued to minors cannot be renewed. A new application must be submitted in person and with the same requirements -- including the father's consent. If he is paying child support, you should be able to locate him. Question: I’m granted full legal and physical custody of my child for a year with a protective order against his father. The father has scheduled visitation few times a month. Can I get my child’s passport by myself or father’s consent is still needed under these circumstances? Answer: Since you have sole legal custody, the father's consent is no longer required. In addition to the requirements, you need to submit the court order proving that you have sole legal custody. Question: I understand sole legal custody is needed to apply for a child's passport. Due to domestic violence (the father of my children was my abuser), we have gone to court and there is a protective order for 3 years. But I did not have the children put on at the time. Can i still apply for the passports with out the father? The reason for moving is to be as far away from him as possible for safety reasons. Also there is a no form of any contact, not even peaceful for any reason. How can I go about applying when there is no custody arrangement? The only court documents I have is him being ordered to pay monthly child support. Answer: Please contact customer service at 1-877-487-2778 for advice regarding your special situation. Question: My kids' father has not been in their lives in over 10 years. We had a mediation agreement but before the judge could sign, he has not shown back up. So I was wondering if I could use my mediation papers to help get my kids passports. Answer: You need to have sole legal custody of your children in order to apply for their passports. Please contact the local family court and your lawyer regarding filing for sole legal custody. Question: I have a 16-month-old daughter. I am divorced from her father and his name is on the birth certificate. He refuses to co-sign for her passport. What should I do? Answer: You need the father's presence or consent in order to obtain your child's passport. If the father does not want to cooperate, you may go to the local family court to get a judge to order him to sign the consent or consult your lawyer about filing for sole legal custody of the child. Question: This so called dad file for my daughter who he never raised but l gave him the privilege to be part of her life but there were some issues so l signed a consent for him to take her back to Africa on 2010 but he took all the documents with him she was living with my mother but now my mother is dead about six months l discussed with him to go to Africa and bring her back but he refused and he is holding the girl documents. Now what do I do? Answer: We recommend consulting a lawyer or contacting the local family courts for assistance regarding the matter. Can I get their passports with out the father's consent? Question: I have a restraining order against my kids' father for me and my kids. He gets no contact with them. Can I apply for their passports with out him? Answer: Yes, you can. In order to apply for your children's passports without the father's consent, you need to fill out Form DS-5525 and submit it with a copy of the restraining order. You need to submit both documents with the other requirements in person with your children at a nearby acceptance facility. Question: I need to get my 8-year-old his passport. His father has not been in his life since before he turned one. How can I go about getting his passport? I have no idea where his dad is. Answer: If the child's father's name is on the birth certificate, you need his consent to apply for the child's passport. Since he has been out of the picture for years, we recommend filing for SOLE LEGAL custody of the child so you can make important decisions and undertake certain processes like passport applications without complication. Passport for my 4 month old son with out dad's consent. Question: Can I apply for a passport for my child? His father refuses to sign for his passport (we are not married) but his name is on the birth certificate. His father is an abuser which I'm in the process of taking care of and he has a record as well. Can I still get a passport for my child? Answer: If the father's name is on the birth certificate, you need his presence or consent to apply for your child's passport. If he is an abuser, filing for a restraining order and providing a copy of such order along with Form DS-5525 can be a way around this. You must submit the copy of restraining order, Form DS-5525 and all other requirements at an acceptance facility. You must bring your child with you when you apply. Question: If my children already have their American passports, does their father still need to give his consent for them to travel to the U.S? Answer: Your children will be able to enter the United States if they have U.S. passports. However, they MAY need their father's consent to travel outside of the country where you currently reside. Please contact the local immigration office to verify travel document requirements for minors. Question: We share custody of my 2-month-old baby but I had to get a restarting order against him due to his temper. He is still allowed to see the baby he just can't be near me and he refuses to approve a passport. I just want to attend a family member's wedding and have my family meet my baby in a few months. Is there a way to get a passport? Answer: A judge may be able to bypass his signature or compel him to sign the consent form. Please contact the nearest family court or consult an attorney to discess your options. Question: How can I obtain a passport if I can't find the father who lives in another country? Answer: If you are unable to locate your child's father, you can submit Form DS-5525: Statement of Exigent/Special Family Circumstances. The statement must explain in detail the non-applying parent's or guardian's unavailability and recent efforts made to contact the non-applying parent. Question: My son's father is not in my son's life. He left when I was 2 months pregnant. Can I apply for his passport as I have no idea where the dad is? Answer: If your son's birth certificate has his father's name on it, you must submit a notarized consent to apply from the father. If you cannot contact the father, you can submit Form DS-5525: Statement of Exigent/Special Family Circumstances.